I apologize for being one day late with my update. My life has been chaotic. First there was my surgery, then there was the 71% rent increase (that’s not a typo) that turned my life upside down and forced me to move. For those of you who don’t know, I live in Seattle, been here for 4 years and life is getting EXPENSIVE. Property values have shot through the roof and it’s hard for a lowly paid writer like me to live. The good news is that I found a home at the last minute that’s within my budget. But going through all of this chaos has delayed everything on the writing side of things. 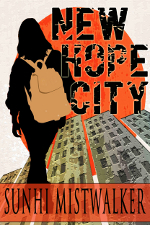 However, I do have a release date for the sequel to New Hope City. I will release the second book by Fall 2015. It may come earlier, but I don’t want to make promises I can’t keep. I KNOW I can get this book released by the Fall, so that’s the date I’m going with. Thank you all for your support and patience! I just wanted to let my readers know that I have NOT dropped off the face of the planet. The past month has been INSANE. To make a long story short I have surgery next week and I’ll be down for at least a month. The short of it is that I have a very large mass in my abdomen which must be removed so I need to go in for surgery. This thing came out of the blue and really scared me, so I’ve been focused on myself for the past month, just trying to stay healthy and calm. But don’t worry, my doctor expects me to fully recover. So I plan to be back soon with more stories, books and blog posts. Wish me luck. I found this cool image on the internet and I wanted to share it. This is probably one of the most powerful images I’ve found on the internet. So many people, myself included, waste time and energy on the things that aren’t important. 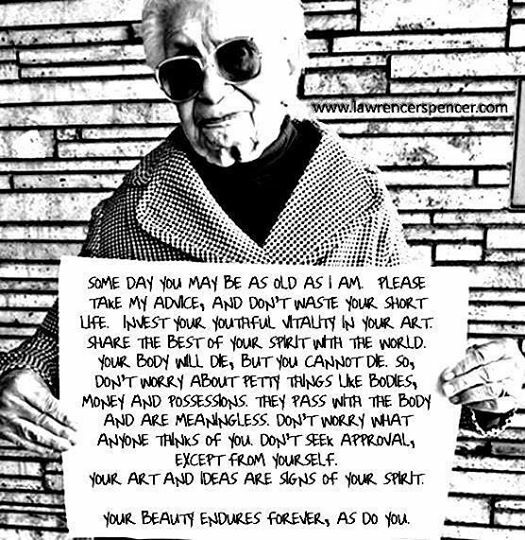 Let’s take this woman’s advice and invest the life we have into living to the fullest, whatever that means for us. I’m usually pretty good about updating this blog, but for the past month I’ve been busy writing the After The Darkness series and working on some short stories as part of the Clarion West Write-a-thon. Right now I’m almost halfway through the sixth episode for After The Darkness which will complete the first season. I’ve also recently finished a first draft of a short story set in the same world. And in addition to all of that I’ve been taking classes and connecting with other writers offline. And because I don’t have much time, I’ll need to make this post short. Back to writing! I’m pleased to announce that I’ve been selected to participate in the Artist Trust’s 2013 EDGE Professional Development Program for Literary Artists. EDGE is a nationally acclaimed 50+ hour training program designed to give writers the business skills they need to create sustainable careers. As most of you know, SunHi Mistwalker is a pseudonym I’ve used to pen speculative fiction since the later part of 2011. But I’ve been writing for a lot longer than that. I currently work as a full-time non-fiction ghostwriter and I’ve written screenplays and stage plays as well as short stories under by legal name. I applied for this professional program so that I could hone the business skills necessary to ensure that my fiction career is long and fulfilling. If you live in Seattle, you may have the opportunity to meet me and my fellow EDGE participants when we present our work at the Elliot Bay Bookstore. I’ll update you with the details once they’re finalized. A reminder! After The Darkness: Episode #4 will be released February 28, 2013.